Karina's Kreations: Big Shot Promotion!!! Do want a FREE Big Shot? 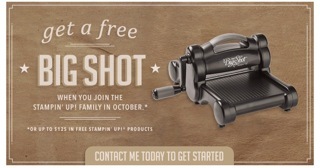 Stampin'Up is giving you one by buying the My Digital Stuio Starter Kit or the Regular Starter Kit. The starter kits are already 40% off so this is a really great deal!!! If you already own a starter kit you can get an additional $125.00 in Free Products. Plus you get to come to my monthly coffee talks held on the first Friday of every month. I would love to have you join me.